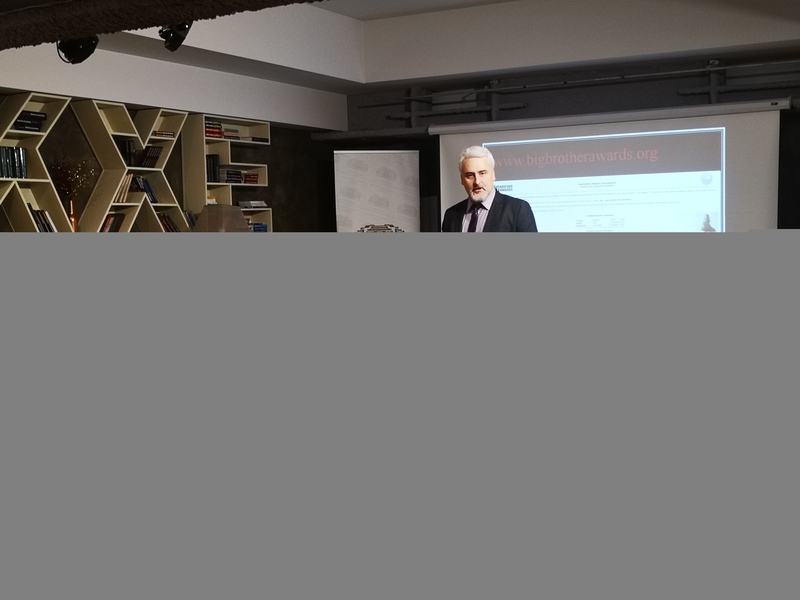 Alexander Kashumov, Head of the Legal Team of NGO Access to Information Programme speaking at Bulgarian Big Brother Award in Sofia, 3 Feb 2019. Photo: Irina Aleksova / Internet Society – Bulgaria, CC-BY. After a six-year hiatus, leading Bulgarian digital rights organizations have revived their country's version of the Big Brother Awards, an “anti-awards” ceremony designed to shame those who violate people's rights to privacy and data protection. Originated by the international human rights organization Privacy International in 1998, the Big Brother Awards have been adopted by multiple civic society organizations in Europe and beyond. The event is intended to increase awareness about serious issues related to misuse of personal data and the harms that this can bring to individuals and society at large. 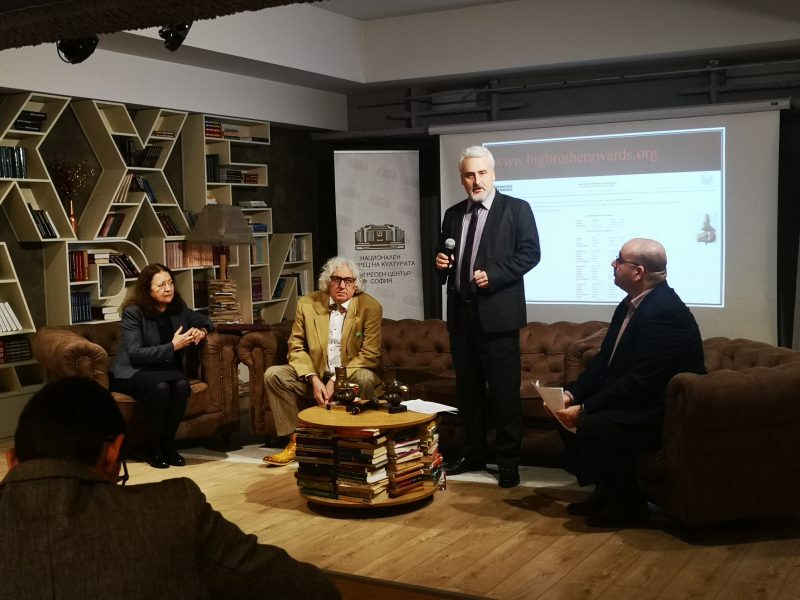 At a February 3, 2019 ceremony in Sofia, the 2018 awardees were announced: Bulgaria's parliament and Center for Education and Qualification of Pedagogical Specialists Ltd., a well-known educational institute, were the big winners. Internet Society-Bulgaria (ISOC-Bulgaria) and Access to Information Program in Bulgaria issued a call for nominations of either governmental bodies, companies or individuals that have violated citizens’ privacy and abused personal data. Members of the public were able to submit suggestions up until the January 24 deadline. “Our goal is to show the public the problems, and raise awareness about them”, said a representative of Internet Society of Bulgaria. With companies and private institutions collecting, storing and processing enormous amounts of personal data (often illegally) in the pursuit of more efficient marketing and greater social control, the event committee received many nominations. ISOC-Bulgaria solicited suggestions from the public, inviting anyone to submit nominations via blog comments (which could be posted anonymously) or Facebook. These were evaluated by a jury of unpaid well-known public figures, including lawyers, academics, consultants, journalists, and civil right activists. The jury subsequently presented two awards: one to the state institution and the other to the private organization that had excelled at violating citizens’ privacy. The National Assembly (parliament) building of Bulgaria. Public Domain photo via Wikipedia. Competition was stiff, with government institutions like the National Security Agency, the State Prosecutors Office, and the Anti-Corruption Commission being nominated, but eventually, the 2018 Big Brother Award for a state organization went to the National Assembly of Bulgaria, for its adoption of a personal data law. In addition to setting new standards intended to protect citizens’ data against misuse by companies and institutions, the law sets specific rules for journalists and their reporting, when it touches upon the lives and activities of individuals. The law sets limitations around the impact that disclosing data will have on the personal life of the subject, the circumstances in which personal data becomes known to a journalist, and the importance of the personal data or its public disclosure to the public interest. All of these stipulations, when subject to interpretation by media outlets and courts alike, could result in a threat to media freedom, especially when it comes to reporting on the activities of public officials. On their own, the criteria are okay. They indeed aid protection, and are in the direction of increasing sensitivity. The issue we have with them is that they can have side effects, and have an adverse effect on another human right — the right to free expression and media freedom. They can be used as rules for conducting the journalistic profession, which in practice can amount to actual censorship. Therefore, the award is not so much for the criteria, as it is for not taking into account the risk of turning them into a threat to media freedom. Dimitar Ganchev, who is a member of the ISOC-Bulgaria board, added that another reason the parliament won out was that the vote on the data protection law was taken without any debate and with very low attendance by ministers. The risk is extremely serious. These laws provide ten points which can be used to stage attacks against journalists. The private sector organization that clenched the Big Brother Award is the Center for Education and Qualification of Pedagogical Specialists Ltd., thanks to a massive personal data leak that affected more than 9,000 students and more than 2,000 of their parents. Lists with their personal data were exposed to the public through various mechanisms, including posting the details on a major social network. 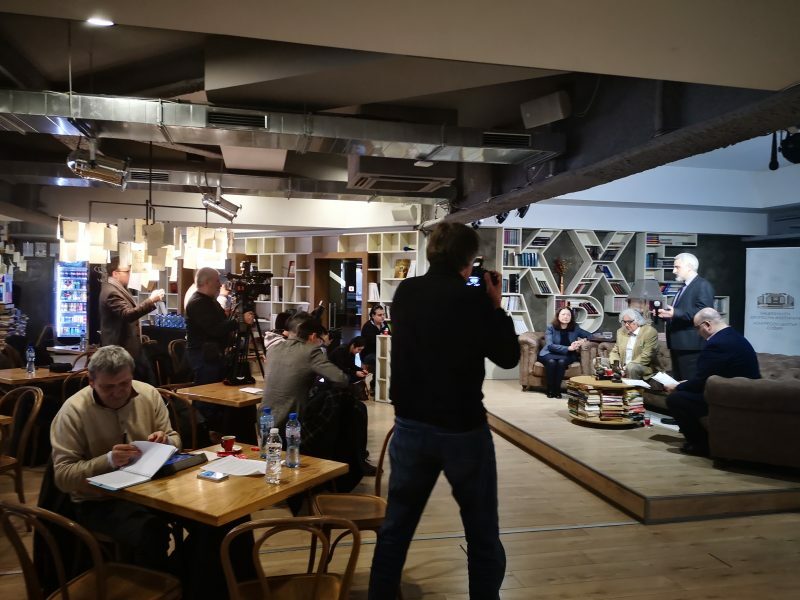 The Big Brother – Bulgaria Award ceremony took place in Writer's club “Peroto” [“The Quill”] in Sofia, Bulgaria, 3 Feb 2019. Photo: Irina Aleksova / Internet Society – Bulgaria, CC-BY. Other runners up in the private entities category included Municipal Forestry from Elin Pelin, Sofia University St. Kliment Ohridski, and Trimoncium, a medical centre in Plovdiv. Though none of the nominees responded to the invitation to attend the ceremony, the organizers expressed satisfaction that the event had good press coverage, unlike other years, when media would hardly report on it. Founded by Privacy International, the awards were inspired by the character of Big Brother from George Orwell’s novel “1984”, which symbolizes the power of the state in conducting absolute surveillance and providing for the basic needs of its subjects at the price of total annihilation of human freedoms. The symbol of the anti-award is a military boot crushing a human head, also a reference to a scene from the cult book. The first Big Brother Awards ceremony took place in the United Kingdom. Since then, a growing number of affiliate human rights groups present the awards in about twenty countries. Apart from Bulgaria, the European version of the awards also takes place in the Netherlands and Germany.